I don't know about you, but I sure do love getting sick. It's probably one of my favorite things in life, behind calling women who want nothing to do with me and playing sports with dudes who believe, correctly, that giving you the ball would be a sin against all that is just and holy in this world. 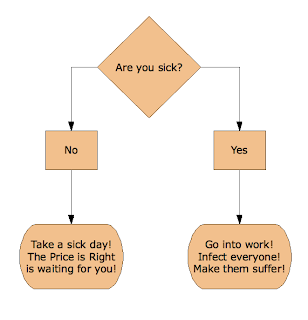 This makes sense, because you don't want to waste a day feeling miserable on anything other than work. 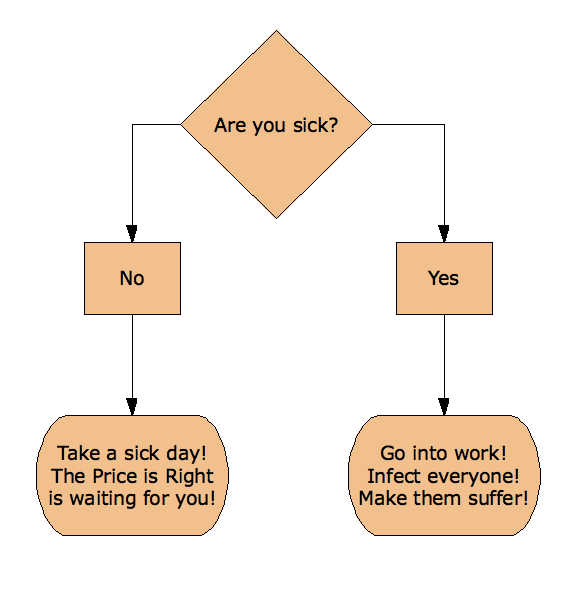 Of course, if you were to ignore this advice and stay home while sick, just know that all of your coworkers think you're secretly interviewing. So you might as well be interviewing. Let us now take a minute of silence to mourn those who have gotten sick while on vacation, the most cursed of all combinations. Someday I'd like to work for a company that allows you to count sick vacation days as sick days, because otherwise that's just cruel. 1. At this point, some of you may be trying to provide the counterexample of someday hearing my children coughing all day long, but I would like to reiterate the "not wanting anything to do with me" aspect of women I know. I've come to the realization that I've evolved perfectly in every way, except that I am only ever attracted to women who find me utterly repulsive. It's a hard and fast law. 2. No amount of apologizing can grant me forgiveness for that act. Though she technically hasn't come around trying to infect me, I wouldn't blame her for it. 3. To my coworkers who all came into work sick last week, I just want to say that yes, I just made fun of your misfortune, and, once again, successfully, argued that the world revolves around me.